In the 19th century extremely violent conflicts took place between mostly Northern Irish Protestants (Orangemen) and Irish Catholics. The Orange Riot of 1870 began on July 12 (known as Marching Day in Northern Ireland), when a parade was held in Manhattan by Irish Protestants celebrating the victory at the Battle of the Boyne of William III, the King of England and Prince of Orange, over James II in 1690. The parade route was up Eighth Avenue to Elm Park at 92nd Street, and as they went the participants taunted Irish Catholic residents, many of whom followed the parade and returned the harassment. At the park, a crowd of some 200 hecklers was joined by a group of 300 others and a riot ensued between the two parties. Although the police intervened to quell the fighting, at least eight people died. The following year, the Loyal Order of Orange requested police permission to march again, but, fearing another riot, the parade was banned by the city’s police commissioner James J. Kelso with the support of Tammany boss William M. Tweed. Catholic Archbishop John McCloskey applauded the decision, but the Orange Order objected (as did newspaper editorials in the Herald and Times and, through a cartoon by Thomas Nast, Harper’s. A petition signed by a group of Wall Street businessmen voiced concern about the growing political power of Irish Catholics including the possibility of a radical political action by Irish immigrants such as had occurred in the Paris Commune. The pressure generated by these concerns among the city’s elite, on top of pressure from good-government reformers against Tweed’s regime in general, caused Tammany to reverse course and allow the march. Governor John Thompson. Hoffman, a Tammany man and former New York City Mayor, rescinded the police commissioner’s ban, and ordered that the parade’s marchers be protected by the city police and the state militia, including cavalry. On July 12, 1871 the Protestants parade began under the protection of some 1,500 policemen and five regiments of the National Guard – about 5,000 men in all – from Lamartine Hall, the Orangemen’s headquarters at Eighth Avenue and 29th Street. By 1:30pm the streets from 21st to 33rd were filled with objecting Irish Catholics. 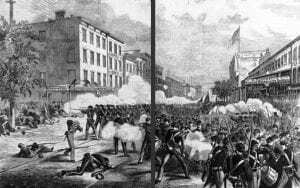 As the parade of Orangemen headed south surrounded by regimental units the crowd began to pelt them with stones, bricks, bottles and shoes – the militiamen responded with musket fire, which brought pistol fire from some in the crowd. The crush of the crowds preventing more forward motion, police used their clubs and the militia their bayonets, but rocks and crockery pelted down on them from the rooftops along the avenue. Finally, troops starting firing volleys into the crowd and the police followed up with mounted charges. The parade managed to get to 23rd Street, where it turned left and proceeded to Fifth Avenue, where the crowds were supportive of the Orangemen. This changed again when the parade continued south down Fifth and reached the entertainment district below 14th Street, where the crowds were once again hostile. The parade then continued across town to Cooper Union, where the marchers dispersed. The riot caused the deaths of over 60 civilians – mostly Irish laborers – and three Guardsmen. Over 150 people were wounded, including 22 militiamen, 20-some policeman injured by thrown missiles and 4 who were shot, but not fatally. About 100 people were arrested. Photo: The Orange riot of 1871 as depicted in Frank Leslie’s Illustrated Newspaper, courtesy wikimedia user Beyond My Ken.